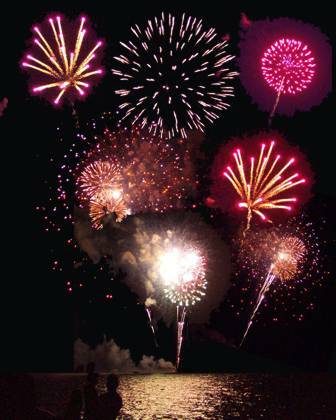 Independence Day commemorates our declaration of independence from the King of England. The revolution officially began two days earlier when the Second Continental Congress approved the legal separation of the American colonies from Great Britain, a resolution proposed by Richard Henry Lee of Virginia in June. 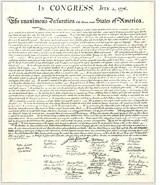 After voting for independence on July 2, Congress debated and revised the Declaration itself for two whole days and approved it on July 4. In the centuries since, only the 111th Congress has moved with anywhere near the speed of that first gathering, since the 111th Congress passed trillions of dollars of spending on millions of pages of bills in less than 100 days. And no one in Washington read any of them. The Declaration of Independence fits on one page. Everyone in the Continental Congress read the whole thing. Imagine that. Nearly eighty years ago we began by declaring that all men are created equal; but now from that beginning we have run down to the other declaration, that for some men to enslave others is a “sacred right of self-government.” … Our republican robe is soiled and trailed in the dust. Let us repurify it. … Let us re-adopt the Declaration of Independence, and with it, the practices, and policy, which harmonize with it. Lincoln spoke of the enslavement of persons. Today our republican robe is soiled and trailed in the dust by a government that would enslave We the Overtaxed People, taking more and more of our rights and our land and our life’s blood to its own purpose. Just to rekindle our liberal friends, Franklin Delano Roosevelt made the “loose fiscal policy” quote. The second session of the current 115th Congress is back to its usual wiener roasts (they have “worked” 81 days this year and are off for the months of July and August) and Nero Claudius Caesar Augustus Germanicus is indeed still fiddling in Washington. Two hundred thirty-six years ago tomorrow, General George Washington marked July 4 with a double ration of rum and an artillery salute for the soldiers who fought off the foreign monarchy that did enslave us. It is now time to mark July 4 with a double ration of electoral salute to those who would be the modern monarchy of government. Let us re-adopt the Declaration of Independence, and with it, the practices, and policy, which harmonize with it. Can you do that? Take the test if you dare. Much of our litigious life today grew out of English Common Law. We abandoned one really good idea in the first Revolution, though. We abandoned the No Confidence vote. An earlier version of this column first appeared in 2011. SWMBO grew up in Wisconsin where they would put her in jail for selling a homemade cookie. I’m eating one of her oatmeal cookies right now and am here to tell you that law would have deprived her neighbors from heaven on a plate. Wisconsin is one of just two states to ban the sale of home-baked goods (New Jersey is the only other). If SWMBO were to sell her brownies or cookies or muffins from her own kitchen to the public there, she could go to jail. 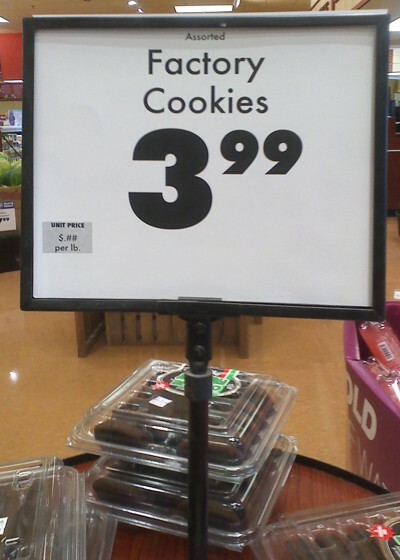 The Wisconsin law requires bakers to buy a license. The license requires a commercial kitchen, health inspections and, of course, fees. Cottage Food laws or regulations generally include some form of kitchen inspection, a zoning permit, a business license, restriction on pets, and more. Wisconsin’s commercial bakers claim the ban evens the playing field for the licensed businesses by removing the unfair advantage for home-based cooks. Still, the state allows the sale of other homemade foods such as jams and canned goods, all made on regular stoves, so I’m thinking state Assembly Speaker Robin Vos puts homemade jam on his muffins. Worthy of note, Wisconsin and New Jersey are not the only states with “Cottage Food Laws.” Many states require some form of kitchen inspection, a zoning permit, a business license, and restrict pets if you home bake cakes, cookies, pies, and breads, make jams and jellies, popcorn or candies, and more. Vermont banned brownies to turn kids on to kale and gluten-free paleo lemon bars. In his oral ruling, the judge said that the ban mainly served business interests. Naturally, the Department of Justice says the state is considering an appeal. Posted in Food, Politics & News, Random Access, Throw Da Bums Out, What? Are They Nuts? Face the Nation was all about the Comey testimony Sunday. I didn’t get to watch Sunday’s episode. Thank goodness for a written transcript. When all is said and done, Mr. Comey went on record with what Mr. Trump had said all along: Mr. Comey admitted that he told Trump he’s not under investigation. Mr. Comey conceded that the nine one-on-one encounters with Mr. Trump were “uncomfortable, but not impactful.” Mr. Comey also made it very clear several times that Mr. Trump never asked him to stop the Russia investigation. Period. And Mr. Comey acknowledged that Mr. Trump only once said, “I wish you would let this go” about the Flynn investigation. The investigations continued unimpeded. The conversations were no doubt unusual and likely inappropriate to a politician used to dealing in nuance and undertone and spin and politics as usual but not illegal. As I recall, the current President was elected to run Politics as Usual right out of town. And how are the Democrats responding? I guess he doesn’t remember that the House passed the original Obamacare bill on November 7, 2009, on a 220-215 vote. Nobody knew what was in that bill. I guess he doesn’t remember that he and 59 other Senators rushed to pass a similar, although not identical Obamacare bill on Christmas Eve 2009 in a 60-39 vote. Nobody knew what was in that bill, either. I guess he doesn’t remember that when Republican Scott Brown won the Massachusetts special election, it left Ms. Pelosi and Mr. Obama in a dilemma. They had to have the House pass the Senate bill before Mr. Brown was sworn in because he would upset the Democrat’s supermajority. The House did that and Mr. Obama signed the Un-American Care Act, a law that was passed with not one Republican vote, two days later on March 23. This turns out to be a story not of “he said, he said,” but of who can spin faster. Mr. Schumer may be ahead on points in a contest only a Tasmanian devil should want to win. CBS News contributor Ed O’Keefe has it figured out. “Every week there’s probably going to be something like this, some public forum where it gets raised again and attention is put on it. Committee rooms and closed door meetings will be the centers of the drama on The Hill in the next few weeks.” Or months. Or years. Congress is supposed to be building a budget, changing ObamaDon’tCare into actual health care, punishing Iran and Russia, passing the odd law or two, paying off the National Debt, and all its other duties but instead it chooses to pretend that political oneupsmanship is more important than statesmanship. I think she must have seen Face the Nation on Sunday because she was really talking about Congress today. 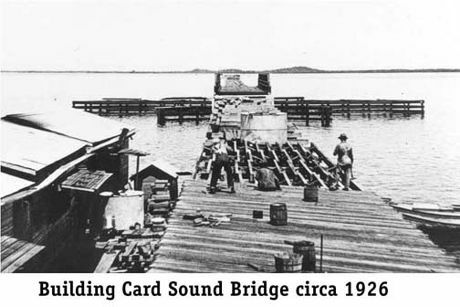 The storied Card Sound Bridge is an old, tall, toll bridge that connects mainland Florida to Monroe County. 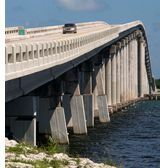 It is one of only two roads enter or leave the Florida Keys (the other is the Overseas Highway, U.S. Route 1) and the only one that costs cash. The current causeway and bridge opened to traffic in 1969 as State Road 905A. By the 1980s, the state transferred the road and bridge to county maintenance although Monroe County pretends it is still a state highway with FDOT route signs along the shoulders. The bridge carries 1,900 vehicles per day at a varying toll, nominally $1 but with an upcharge for more than two axles and discount to as little as a quarter with a ticket book. The toll is waived upon evacuating the Keys for hurricanes or in instances in which US 1 is impassable. Guesstimating that all the tolls average out to a buck, the Card Sound Toll Authority collects about $700,000 annually to operate the toll booth, maintain the toll facilities and grounds, and mow and cut the brush on the right of way along Card Sound Road. Monroe County budgeted $3,448,648 for the Card Sound Toll Authority this year. That’s up 110.8% from the $1,635,705 budgeted in FY2016. A $2 million plus project to convert the toll booths there into an automated “Sunpass” system could break ground as soon as August 1. The Monroe County Commission has approved a $1.79 million construction contract plus an engineering contract for $263,700 more. The toll booth staff will be fired July 31 and the toll booths could be demolished the next day. No tolls will be collected during reconstruction, until the system becomes active next February. The “All Electronic Tolling System” will connect to the Sunpass to collect tolls through those transponders or toll-by-plate. How hard is it to tell the toll collector, “Charge $1.25”??? More telling is the price of this particular boondoggle. If the toll authority collects $700,000 and spends about five times that much annually, how are We the Overtaxed People going to pay off the $2 million “upgrade”? KEY LARGO, March 26, 2018–Most vehicles will pay $1.50 tolls electronically beginning June 2, 2018. The new rate is $1.50 for a two-axle vehicle. Larger trucks and other multi-axle vehicles will pay $1 per axle. The new electronic-tolling system also will allow commissioners to raise district tolls at will. Posted in Politics & News, Random Access, Throw Da Bums Out, What? Are They Nuts? We all noted, back in 2009, that we’d really stepped in it this time. Pundits have said that the new Administration’s need to stack accomplishments during the first 100 days is the reason for the rush to pass a health care bill. Nothing could be further from the truth. Nicky Shaw and I talked about the two big issues in Washington before the 115th Congress left for their 97th vacation so far this year. “This Congress has been very busy,” she said. Yeppers. They codified the Presidential Innovation Fellows Program, passed a GAO access act, disapproved of an SEC rule, authorized the National Science Foundation to support entrepreneurial programs for women (I guess women weren’t allowed to be NSF entrepreneurs before that? ), and passed a joint resolution to appoint a citizen regent for the Smithsonian Institution. Oh, yeah. And they repealed ObamaDon’tCare and are about to cut the corporate tax rate. We’ve covered that taxpayer-financed insurance bailout for seven years. She’s right. And that pullquote up there about the rush to pass? That’s from 2009. In 2014 the United States had the third highest general top marginal corporate income tax rate in the world at 39.1% (consisting of the 35% federal rate plus a combined state rate), exceeded only by Chad and the United Arab Emirates. Shareholders of most corporations are not taxed directly on corporate income, but must pay tax on dividends paid by the corporation. However, shareholders of S corporations and mutual funds are taxed currently on corporate income, and do not pay tax on dividends. Hmm, if corporations are people (viz. Citizens United) then they are taxed without representation. I’m thinking corporate income tax is unconstitutional if they are taxed without representation and we shareholders should revolt. And, bonus, we can blame the Democrats for the income tax! See, the Democrats first called for income taxes back when the whole idea of it was still unconstitutional. During the two decades following the expiration of the Civil War income tax, the Greenback movement, the Labor Reform Party, the Populist Party, the Democratic Party and many others called for a graduated income tax. The Socialist Labor Party advocated a graduated income tax in 1887. The Populist Party “demand[ed] a graduated income tax” in its 1892 platform. The Democratic Party, led by William Jennings Bryan, advocated the income tax law passed in 1894, and proposed an income tax in its 1908 platform. In 1894, Democrats in Congress passed the Wilson-Gorman tariff, which imposed the first peacetime income tax. In 1895 the United States Supreme Court, in its ruling in Pollock v. Farmers’ Loan & Trust Co., held a tax based on receipts from the use of property to be unconstitutional. Do ya feel as if we’ve been here before? Do ya remember electing a President who promised “change”? No matter how you dress up the typeface, the “UnAmerican Health Care Act” is just the “Unaffordable Care Act” in a new TV costume. No health care reform there. No matter how you dress up the characters, the “Tax Cut” is just the 4,037 or 70,000 page tax code in a new TV costume. No tax reform there. And the only actor who has changed in this play is the guy at the top. Passing a health care bill in the first 100 days. Why was it critical in 2009 and critical in 2017? Back then I thought even Congress would rebel if they actually read the bills. Turns out that was wrong this year, too. Passing a tax cut in the first months. I had hopes for tax reform. This year, it looks like that was wrong, too. “Maybe We the People should revolt instead,” Ms. Shaw said. And there you have it. Since corporations are people and they buy their representation, that means We the Overtaxed People are no longer represented and that’s the hook to use.